Did you know that September is National Yoga Month? Years ago I used to do Yoga every evening, then for some reason I got out of the habit. I recently decided to start again, and have never made a better decision. Now I remember why I liked it so much in the first place; not only does it stretch and work out every muscle in your body leaving you more limber and toned, but it is incredibly relaxing helping you sleep better, make better decisions and function better in all you do. In helping me to get back into my routine, Aurorae Yoga sent me some amazing yoga essentials to review and share with you. 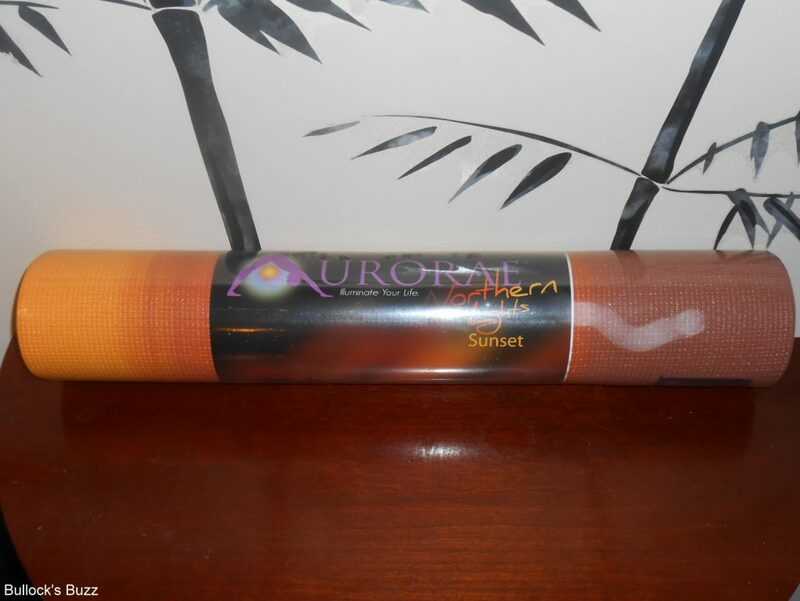 Started by a cancer survivor who began yoga as a way to help his body rebuild and develop inner peace for his mind, Aurorae Yoga is well-known for their top-of-the line, affordable yoga products created for the purpose of helping you have the best yoga experience possible. Their collection includes all of the yoga essentials such as mats, straps, blocks, clothes, towels, accessories and more; all of which are environmentally friendly and safe for humans and animals. The three items I was sent have really helped make my yoga experience complete. 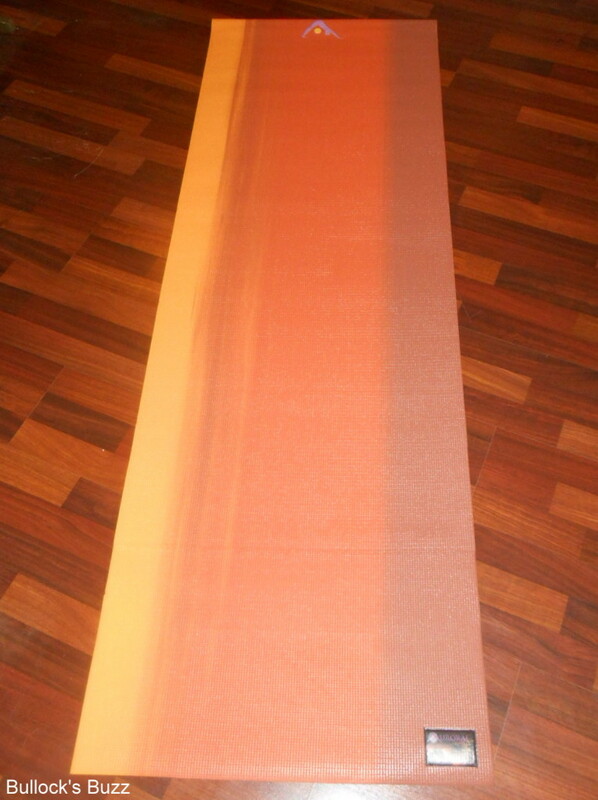 The first item I was sent is the Northern Lights Yoga Mat in Sunset. The Northern Lights collection was created with the idea of drawing out the potential that is within all of us. Aurorae wanted a design that replicates the natural phenomenon and energy source of the Northern Lights, and they succeeded. Each individual mat in the collection has a uniqueness of its own, and no two mats are the same. They all feature a Golden Sun Focal Icon placed at the head of the mat which you can use to help you focus. 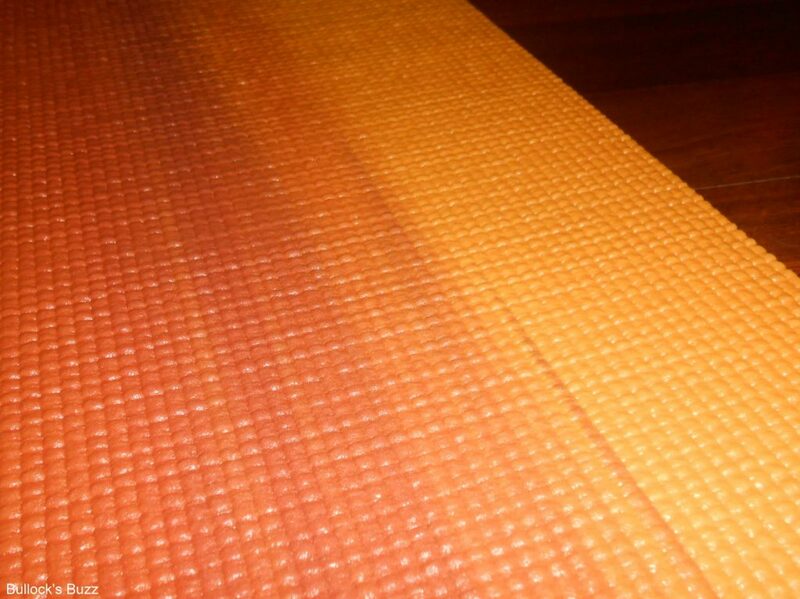 These mats are biodegradable and made from eco-safe PER which is also free from phthalates, latex and silicone. They are extra long in length, 72″ long and 24″ wide, and are 5 mm thick to help provide cushion and absorb the impact on your joints. They are also very lightweight, making them easy to carry with you to class or take on a vacation. Best yet, the mats are machine washable, although you need to hang it out to dry as opposed to putting it in the dryer. While there are several color choices available in the collection, I was sent the Sunset mat which is a beautiful blend of the reds, oranges, yellows and purples found in the sunset. I find the colors to be an interesting blend of both energy and peacefulness which serves me well depending on what part of my workout I am on. I especially love the length, width and thickness of my mat. While I am only 5′ 3″ tall, every other mat I have had in the past has been too short, and as I moved from one pose to another I was always having to pay attention to my body’s placement to make sure I remained on the mat and not on the floor. With this mat, I can focus on what I need to focus on instead! The thickness is perfect for me especially since we do not have carpet in our apartment where I do my yoga. I was quite impressed the first time I used the mat and wasn’t able to feel the hardness of the floor beneath me! I like that the mat holds its shape after each workout, and remains soft yet firm. It reminds me of memory foam in that it forms to my hands and feet during my routine allowing me plenty of grip on the floor, and then it returns to its normal shape a few minutes after I am done. 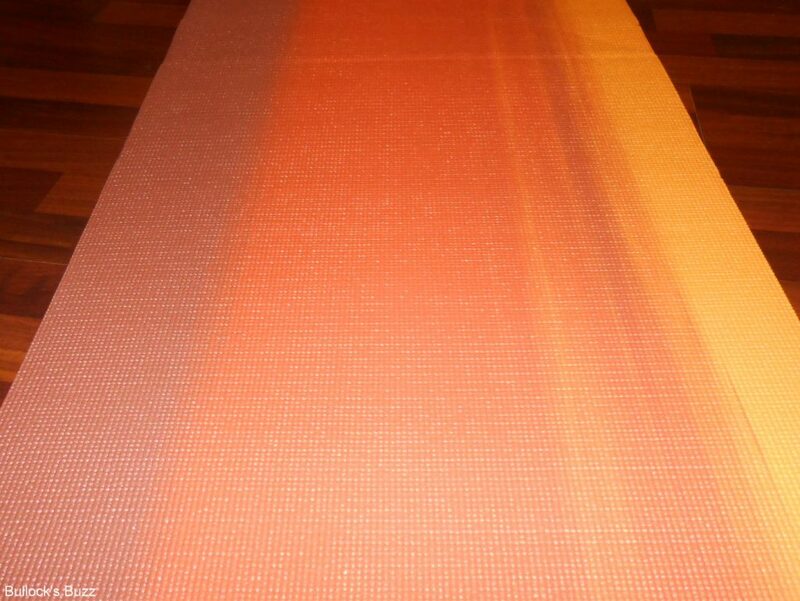 This softness also makes this mat perfect for doing other exercises such as sit ups, push ups and others. Another thing I really like about this mat is that it has the perfect amount of ‘stickiness’. I didn’t find myself slipping as I got sweaty which was quite nice! I also like that there is no overpowering rubbery or synthetic odor, and that this mat does not retain sweat or body odor at all! After each workout I simply wipe it down, let it dry, then roll it back up. Once a week I throw it in the washing machine, then put it outside to dry. 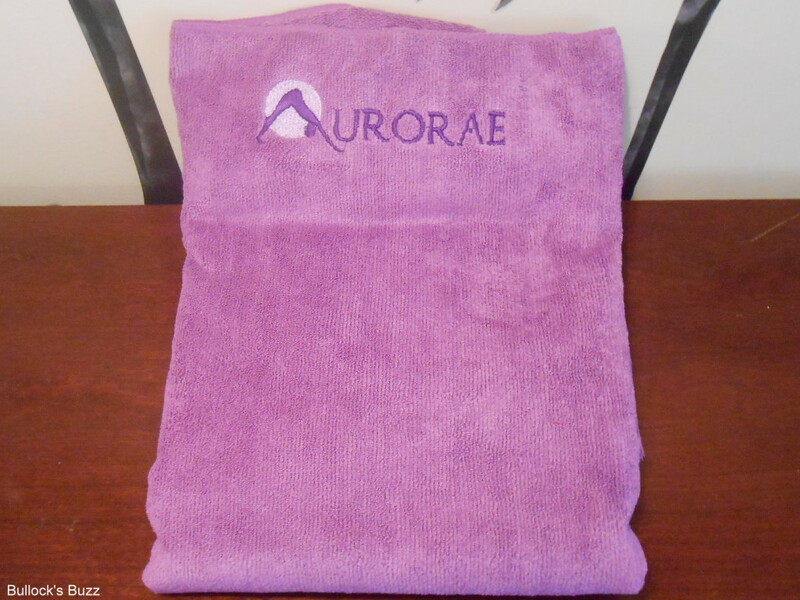 Aurorae’s Micro-Fiber Yoga Mat Towel is the perfect towel to wipe away moisture and help create a slip-free surface. It is not only hygienic, but is also eco-safe. Like the mat, this towel is huge! It measures a full 72″ long and 24″ wide, yet it is very light weight and easy to carry around. There is also a smaller Sport size towel available which measures 30″ long by 20 wide”, but I find this one to be the perfect size for my needs. 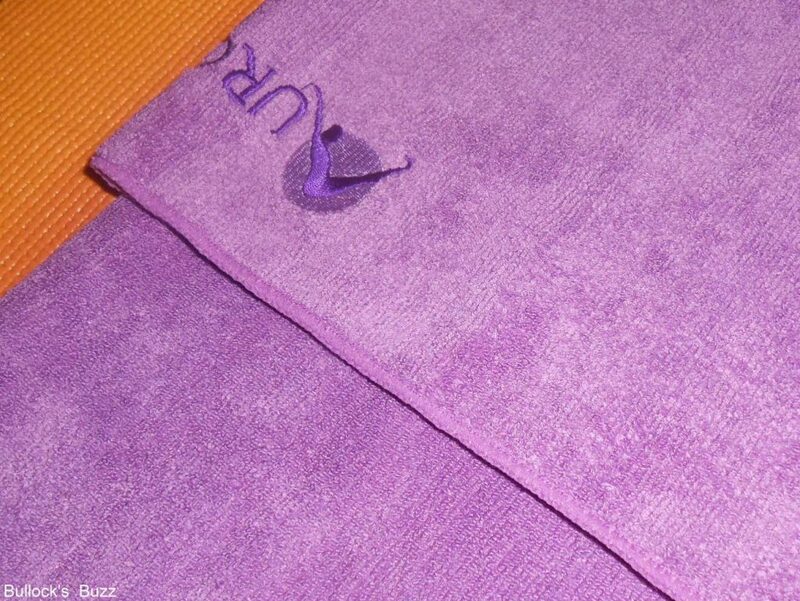 While the towel is not super thick, it is actually quite soft and lush, and is very absorbent. You can use this towel in several different ways. 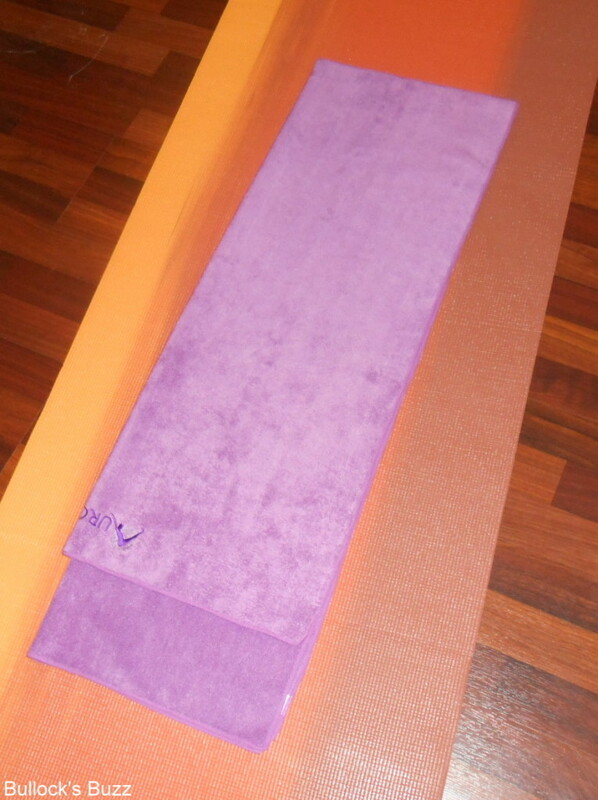 If you are ever doing yoga on a surface like carpet, place the towel under your mat to help keep the mat clean. You can also place it on top of your mat to add extra prevention against slipping and to keep any perspiration from accumulating on the mat. Since I personally do not like having a towel on my mat as I workout, I tend to use mine more for wiping the mat and drying myself off. It works great and is very soft! In fact, it is much more absorbent than any of my regular cotton towels! For the purpose of this review, I did try it on top of my mat a few times and I noticed that while it does not 100% prevent slipping, it does decrease the frequency. And did I mention how much I love the color which just so happens to be my favorite color, purple! I am especially happy that the color is not fading at all, nor is the towel losing any of its softness despite the fact that I have washed it several times. 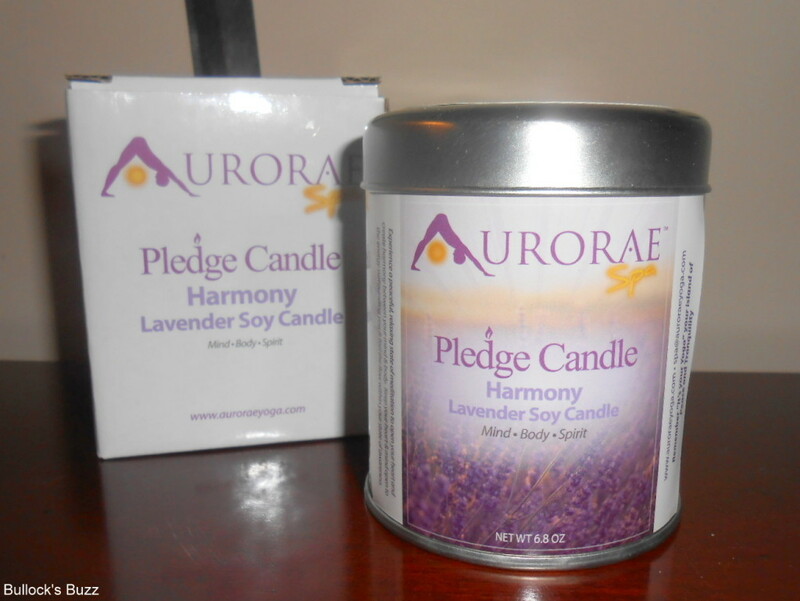 The last item I received for review is the Soy Wax Pledge Candle by Aurorae. This 6.8oz meditation candle is made of 100% soy wax which means it burns extremely clean without any black smoke or soot. It comes in a recyclable, non-toxic tin container, and has 30 to 35 hours of burn time. It is a lavender-scented candle, which is very calming and great for stress relief. The first time I lit this candle, within 5 minutes the entire apartment was filled with the relaxing scent of lavender. I love that it really smells like lavender essential oil, and not like those fake, manufactured lavender scents. It is perfect for meditation, yoga, pilates and just plain relaxing. 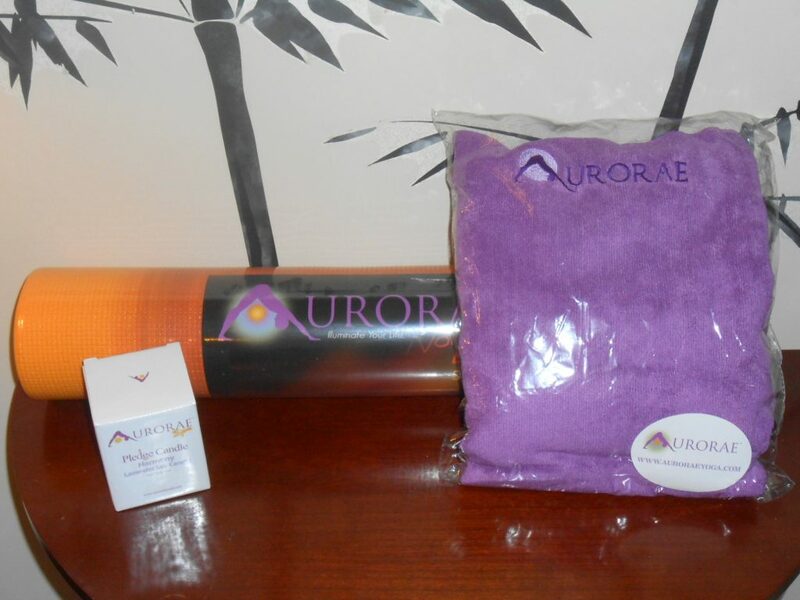 Overall I love my Aurorae Yoga products. Each one is of the highest quality and plays an essential part in my Yoga routine. I highly recommend their products to anyone who practices or wants to begin practicing yoga. 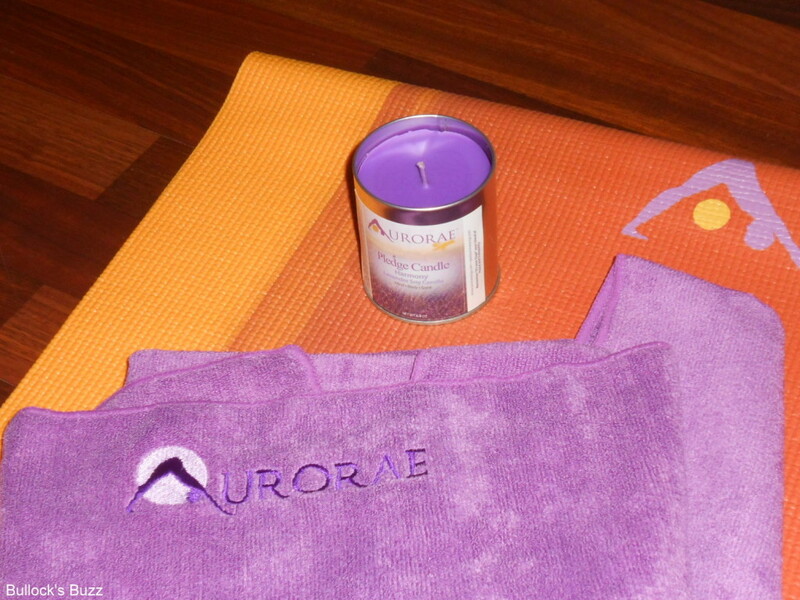 Aurorae Yoga products are available directly through the Aurorae website. 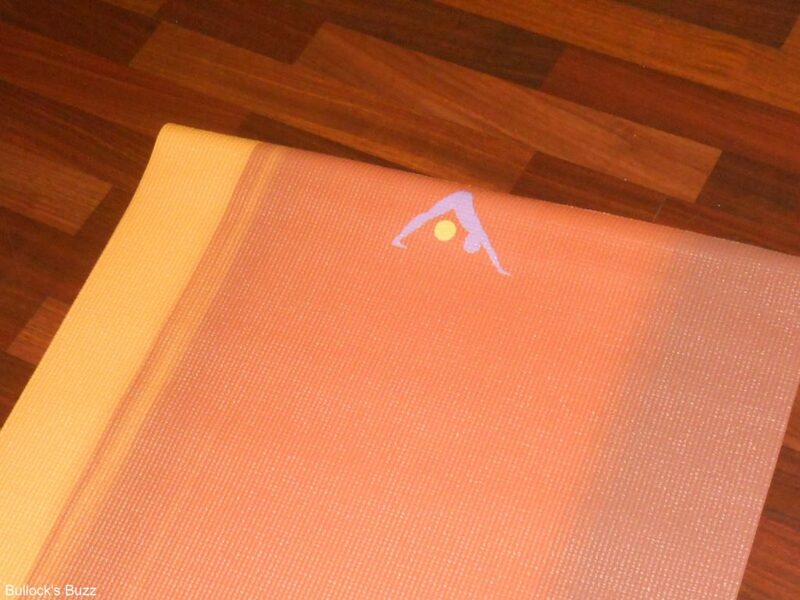 They are very affordable and perfect for Yoga practitioners of all levels. They have a wonderful collection of everything you could possibly need to complete your Yoga experience. Be sure to check out their website for their complete collection, and connect with them on both Facebook and Twitter for all the latest products, promotions, giveaways, information and more. Believe it or not my Mom (who will be 91) is still doing Yoga-to a lesser extent then she used to-but still does it! There is definitely something to be said for this–me no–but I’m sure she would appreciate the clothing! All the yoga supplies can definitely get someone in the right frame of the mind to center themselves!! I’m loving the towel!! I can actually vouch for these products. I LOVE THEM! Yup, I’m a yoga freak. Wow! I love the color of that mat! And machine washable – that’s awesome. I’ve never heard of Aurorae, but I’m going to have to check them out after I have this baby and start Yoga/working out again! 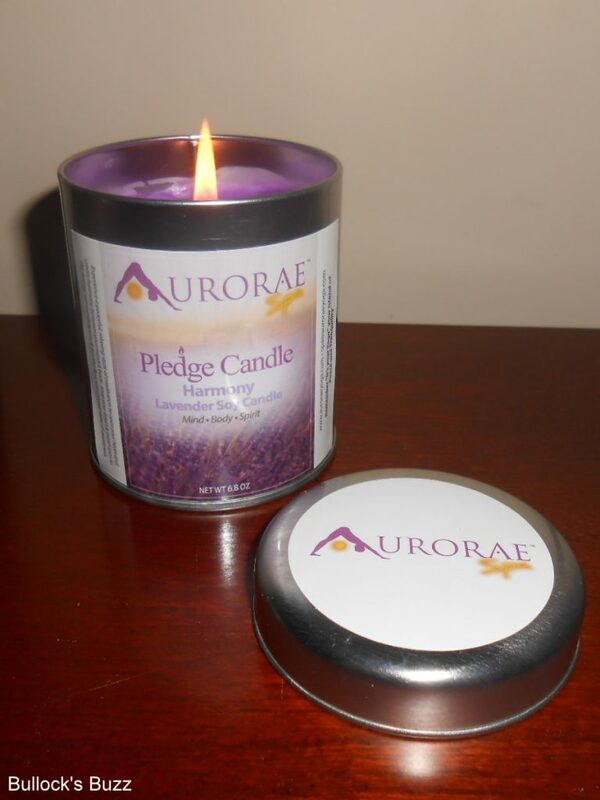 I’ve heard a lot about Aurorae but have yet to try their products! I’m a huge yoga buff so I will def look into it! thanks so much for sharing! I did not know that September was Yoga Month! I really enjoy doing yoga! These seem like great products. That candle looks great! This looks like a great yoga mat! I need a new one and this one looks like a perfect fit. That is an amazing yoga set. I think I would be heaven using it.